In a wide-ranging interview, the Sinn Féin leader said her party still has the political will to get back around the table for talks. 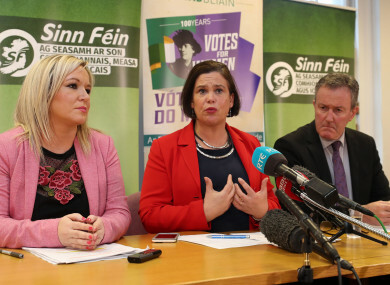 Sinn Fein's vice president Michelle O'Neill (left) and Sinn Fein's president Mary Lou McDonald (centre) and Conor Murphy at a press conference yesterday. SINN FÉIN LEADER Mary Lou McDonald has said a deal to restore the power-sharing institutions at Stormont must be reached as a return to direct rule “is not acceptable”. “If the DUP crashed this thinking that they would return to the bosom of direct rule, they thought wrong, because that is not acceptable to us, said McDonald. “It would be absolutely unacceptable to broad nationalism,” she added, highlighting that direct rule is a non-runner to progressives in the North, the SDLP, the Taoiseach and Tanaiste. “A deal has to be done,” said McDonald, who added that in the absence of the institutions in the North, Dublin must have “a direct and substantive role” in terms of the administration of the North. In a wide-ranging interview with TheJournal.ie today, the new president said Sinn Féin still has the political will to get back around the table for talks. However, McDonald said she could not speak for DUP leader Arlene Foster. On Wednesday, Foster collapsed the talks on the issue of the Irish language. Foster said that she “respects the Irish language” but that her party cannot agree to a standalone Irish Language Act, as is sought by Sinn Féin. Her statement was contradicted by Sinn Féin which said that an agreement had been reached late last week, but the DUP did not follow through on its commitment. Yesterday, McDonald put some of the details of the agreement into the public domain, stating that three separate acts were included in the draft agreement: An Irish Language Act, an Ulster Scots Act, and a Respecting Language and Diversity Act. McDonald said she wanted to clearly point out that it was never envisioned that the Irish language would be compulsory, or that there should be civil service staff quotas. She added that there was no deal on marriage equality. “We came to a position late last week where we had an accomodation and a draft agreement with the DUP. From our perspective, it wasn’t perfect, but you don’t get everything,” she said. McDonald said she felt it represented a “fair, balanced, honorable and workable” answer to questions around the Irish language, legacy funding, the bill of rights and the petition of concern and also provided a pathway in respect of marriage equality. “Although there has been no meeting of minds on that, the DUP are not doing marriage equality,” she said. North Belfast MP and DUP Deputy Leader Nigel Dodds denied a deal was agreed, stating that “the Sinn Fein propaganda machine is in full flow”. “Northern Ireland now needs Her Majesty’s Government to set a budget and take decisions to help our schools, hospitals and infrastructure,” he said. McDonald categorically denied that any such propaganda was being rolled out by her party. I don’t mean, by any stretch, mean everybody in the DUP, but there are elements, you can hear them on the airwaves. I became very alarmed when I heard public commentary from people who know better, encouraging a view to unionist people out on the ground … saying ‘you’ll have to learn Irish’. To you or I that might sound a bit daft. But for those people, I understand that it caused fear, it caused resentment. Totally and utterly fabricated. So for that reason, Michelle [O'Neill - deputy Sinn Féin leader] and I took the decision to put information into the public domain, to give clarity, to bring sanity, to bring balance, to demonstrate to people that these issues can be solved. McDonald said “political will” to solve the issues is needed. “We still have that in spades. We know this has to be sorted out,” she said. Does the DUP have the political will to return to talks? I don’t know is the short answer. All I can base my assessment on is the actions people take and the words they say and on Wednesday evening Arlene pulled the plug. She said she found Foster’s remarks were “fairly strident” and “fairly definitive”. McDonald said she couldn’t put a timeframe on when she thinks the situation can be sorted out, adding that Sinn Féin cannot continue to engage in protracted talks “for the sake of it”. “You have to deliver for people,” said McDonald, who added that she believes there are members of the DUP who agree with her, and want to move on. What I think unionism has to understand is that when a section of society comes and knocks on the door and says ‘look, we’re here too, recognise us too’ – that is not an assault on your identity. It is simply asking you to extend the same respect and generosity that you would like to be extended to yourself. Unfortunately the dynamic in unionism is not lending itself to that or more to the point, there are people within unionism who would privately agree with what I am saying here, but for reasons that I cannot fathom, they are not willing to step out and say ‘listen folks, this is where we are at’. McDonald said it was now time for the Irish and British governments to “step into the fray” and do some heavy lifting. However, since the talks collapsed, criticism has been levelled at the UK Prime Minister Theresa May and her intervention in the ill-fated talks, with some stating that her arrival proved a distraction. When asked about those reports today, McDonald said she believed all parties present in Belfast this week were there to do good. “I have seen that argument, but you could equally say that all concerned didn’t come to cause a problem, they came to be supportive,” she said. I don’t think it is necessarily a bad thing that they are showing up. The timing of it – you may question – but certainly the intent of it, and I have to say on both parts, I think was to be constructive. How the DUP interpreted that, what was going on within that party, is a different matter. I don’t think they arrived into Belfast other than to be anything but constructive and helpful. This viewpoint was echoed by the Northern Ireland Secretary Karen Bradley today, who insisted that May was right to visit Stormont on Monday. The full interview with Sinn Féin leader Mary Lou McDonald will be published tomorrow evening. Email “McDonald: 'If the DUP crashed this thinking that they would return to the bosom of direct rule, they thought wrong'”. Feedback on “McDonald: 'If the DUP crashed this thinking that they would return to the bosom of direct rule, they thought wrong'”.